Thanksgiving is behind us, the leftovers have been consumed, our shopping carts have been filled, and now it is time to focus on something new...CHRISTMAS! I can't think of a better way to transition into the Christmas season than with COOKIES, can you? 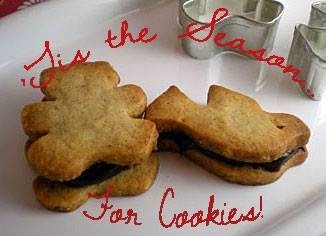 That is why some fellow bloggers and I are doing a "Tis the Season for Cookies" Round-Up! Each week we will feature different cookies for you to try! This will be a delicious endeavor to say the least! To go to my fellow cookie makers blogs just look for their links at the bottom of this recipe! 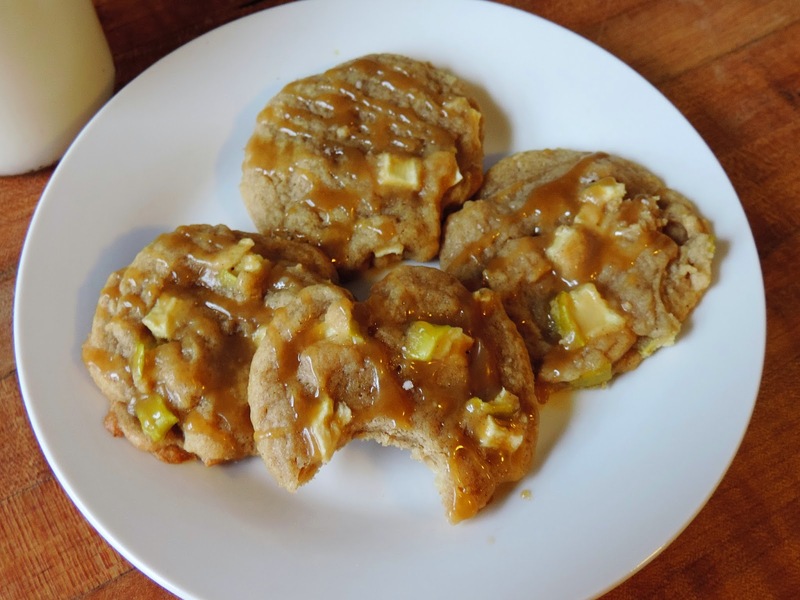 To kick of my portion of this cookie adventure I bring to you my DELICIOUS Apple Pie Cookies w/a Salted Caramel Icing! They taste JUST LIKE little bite-sized pies and I know you are going to LOVE them. As always, when baking, you are going to want to preheat the oven to 350 degrees. Then in a bowl you will need to combine the flour, salt, baking soda, and apple pie spice. If you do not have apple pie spice you can simply combine some cinnamon, nutmeg, and clove. Then, in a separate bowl, you will add the butter, granulated sugar, brown sugar, egg, and vanilla. You will want to "cream" those together with a mixer. Once everything is creamed together, you will begin to add the flour mixture a little at a time until it is all combine with the creamed sugar. Next, gently fold in the diced apples. After that, make 2 inch dough balls and place on baking sheet. Make sure you give them plenty of space to spread out. Then place them in the preheated oven and bake for 12-15 minutes. You want them to be slightly underdone in the center. YIKES! Sorry for the HORRID picture! While the cookies are baking, place the brown sugar, butter and cream into a sauce pan. Put it on medium/low eat, and allow it to melt, while stirring continuously for 5 minutes. After 5 minutes it should look something like this. Salt. Cook for 1 more minute. Set aside to cool. I actually like to pour this into a bowl. Once the cookies are finished baking allow them to cool, on the tray, for 10 minutes. Then place them on a cooling rack for 10 more minutes. Once the cookies are completely cool, take a spoon, and drizzle the caramel over the top of the cookies. I also like to sprinkle the tops with a little sea salt, but you do not have to. These cookies cover the gamut of flavor! Sweet, salty, sour, it is like a holiday in your mouth and I know your entire family is going to go crazy for them! 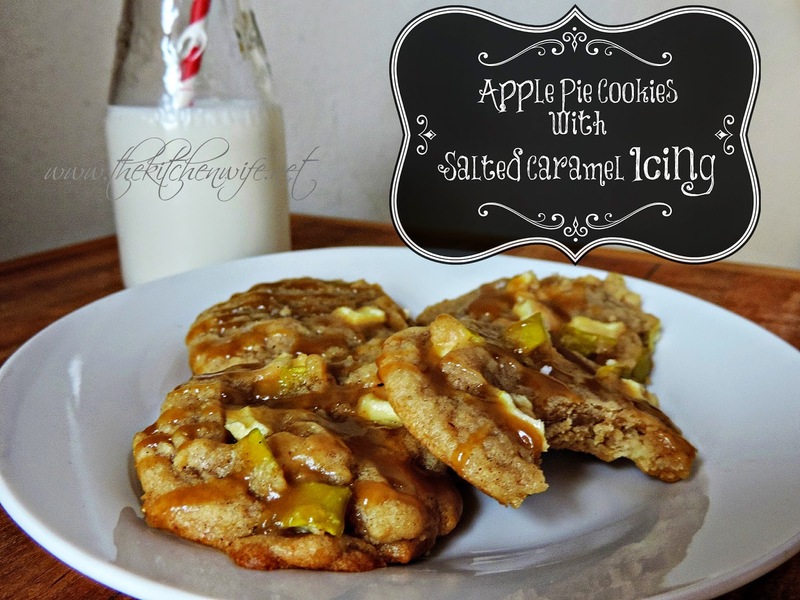 So kick off your Christmas season with some FANTASTIC Apple Pie Cookies w/a Salted Caramel Icing and if you are looking for other cookie ideas, check out the links below. Then, in a separate bowl, you will add the butter, granulated sugar, brown sugar, egg, and vanilla. You will want to "cream" those together with a mixer. Next make 2 inch dough balls and place on baking sheet. Make sure you give them plenty of space to spread out. Then place them in the preheated oven and bake for 12-15 minutes. You want them to be slightly underdone in the center. Then add a little vanilla and salt. Continue to cook for 1 more minute. Once the cookies are finished baking allow them to cool on the tray for 10 minutes. Give the caramel a little time to set up. For more great cookie recipes, check out these great blogs as well!